This past weekend was a big step in my career as a writer–I attended my first writers’ conference! It was the Henderson Writers’ Group conference in Las Vegas; the crowd was small (limited to 150 people), the classes offered were a mix of business and craft, and the faculty was interspersed with interesting individuals. It was a good first conference, in my now slightly more qualified opinion; since it was relatively small, it was not too overwhelming, yet it still offered the opportunity to make some influential connections with agents! I will start with the pros of the conference. The first and foremost bonus is getting to pitch to agents. Yes, it’s scary, and intimidating–but do it! When I arrived at the conference I didn’t know that formal pitches were an option, but quickly found myself signed up to pitch to two agents and two small press editors. Did I panic slightly? Of course. But I simply reminded myself that I know my book and am confident in my book, and it went just fine. In fact, all of the agents and editors requested either partial or full manuscript after my pitch! I had a good experience, but that is not solely why I advise authors to take the plunge and pitch at conference–you should do it because chances are relatively limited for you to run into agents during breaks and such. Before I attended the conference, I had read the opposite advice which told me it’s better to try and casually run into agents and spark conversation. However, after having been to the conference, I have to say that is leaving a lot to chance. If there is a chance to get your name down for a (no matter how small) amount of time to talk to an agent or publisher about your book–do it! The next pro for me was that I met a potentially great friend/colleague; we met at the breakfast section of the day, and ended up being in the same class sessions, so we got a lot of chances to get to know one another and talk about each others’ books. Now we plan to email regularly and exchange critiques and editing advice. This isn’t to say that I just met one person and stuck to only talking to them all day–I talked to a lot of different people, and that in itself was a pro. Meeting fellow writers is always interesting. Now, the cons. First and foremost, I was already knowledgeable on most of the information presented in the classes. Most of this information is accessible on great websites such as AgentQuery and Writers Digest. Due to my extensive research on querying and agents after I finished my novel, I had stumbled across most of, if not all, the information presented in the class sessions (I stuck to mostly the business/querying type of presentations, so I can’t speak as much to the craft sessions). Thus, for me the conference was a learning event, but not in the sense of the structured classes. The second con I will list is the inaccessibility of the agents that were present at the conference. The only time I saw an agent outside of the pitch session room was when they were teaching their classes. This made it difficult to interact with them (which was most likely by design, at least in the case of one particular agent! ), so had I stuck to my original plan which was to organically strike up conversation, I would have been sorely disappointed. Like I said above, the pitch sessions saved my weekend from being disappointing! Now that I have attended my first conference, I have been getting asked whether or not I will attend another one. The answer is “probably.” I think I will be more selective in the conferences that I attend; I want them to be a bit more high profile. Now that I know more about agencies and agents I may want to target, I can look out for conferences they may be attending. I will be looking to see what kind of pitch opportunities will be available. There are a couple high profile events that I will consider–namely, the New York Pitch Conference and the San Francisco Writers Conference. However, right now, I am switching gears and will be exclusively focusing on my first round of querying agents; I sent out my first materials requested email today to an agent who requested a synopsis and partial, so I am very excited about that (excited, but also fully prepared to wait for a response or simply never get one). Aside from querying, I will, of course be diving back into my work on Inductance; I think getting back in the flow of writing might be a little tricky after my mini-vacation, but I am excited to ebb back into the story! This is a post that most likely will become a before and after comparison in two parts as I will probably need to post once I get back regarding what I forgot/should have brought. However, I noticed a couple followers mentioning they have not attended conferences, but might in the future, so I will give you a little cheat sheet summarizing my list things I plan to bring after extensively scouring the web for tips. Of course I am bringing the obvious things: pen and paper, business cards, etc. I am also bringing three copies of my synopsis and one copy of my first ten pages. I don’t know if anyone will actually ask to see them, but I want to have them on hand–it’s better to be prepared. One other item that I stumbled upon yesterday was a One Page. A one page is just like it sounds–one page in which you state your name, bio, contact info, book title, word count, tag line, one paragraph synopsis, target audience, and series description (if applicable). I thought this was such a great idea that I immediately threw one together! I included a picture on mine, and used textboxes for blocking it out and including pops of color–best of all, I matched the fonts, color scheme and picture to my business cards for a professional, coordinated look. I plan on bringing ten copies of my one page with me to the conference as I think it will be the most distributed piece of information. Finally, I am going to bring a copy of my manuscript. I read a lot of conflicting views on this choice, but what stood out to me was the advice to bring it along just in case. Being the type of person I am, I would simply rather lug around a 275 page manuscript all day than miss out on the opportunity to give it to an agent who might request it! My soon to be aching shoulder will probably argue me on the advisability of this decision, but I am sticking to it. On another note, I read a lot of disturbing advice saying not to stalk agents, sneak your manuscript into their bags, or corner and pitch to them in the bathroom. To me, I find this advice laughable as it is purely following the laws of common sense and courtesy…but I saw this similar admonishment on SEVERAL websites! I truly hope I don’t see any examples of that embarrassing behavior this weekend, and I can assure you all I don’t intend to be so aggressive with my manuscript. In fact, I fully expect it to stay in my purse and travel back home with me. That’s what I will be carrying along with me in my (obviously gigantic!) purse this Saturday. As far as the outfit to coordinate with said purse…well, I haven’t gotten that far yet! Unfortunately this lack of wardrobe selection is troubling me more than my lack of pitch preparation. However, I am of the firm belief that my pitch will turn out a lot better if I am impeccably attired. With that being said, I am off to my closet to plan! I will be posting one more time tomorrow (if I am not too rushed), and then I am leaving for Las Vegas through the weekend! If anyone else is attending the Henderson Writers’ Group Las Vegas Writer’s Conference, please let me know–I would love to meet some of you! It’s writers conference week!! I am not nearly as prepared as I should be, but (as I like to remind myself) it is only Tuesday, so I have plenty of time to prepare! I didn’t post here yesterday because I was out of the office for the day running errands; one of the stops I had to make was picking up my new author’s business cards. I had not even thought of the concept of having a card if you are an author, but I stumbled across the tip while reading up on preparing for a writer’s conference and was shocked I hadn’t thought of it earlier myself. I fully expect to meet lots of new people this Saturday and now they will have an easy way to remember me! 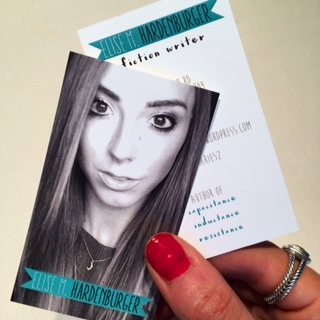 My good friend and graphic designer, Michaela, created the cards’ design for me and they are perfect! The only thing I stressed about was whether or not to include the titles of the next two novels in the trilogy since Capacitance is the only one finished as of now. Ultimately, I decided to include all the titles so I won’t have to go through reprints every time I finish another book. Besides my personal information, I included a photo of myself on one side of the card–I think this is a great way to make myself memorable because there will be a face matched to a name. I am terrible at names, and this is a fairly common problem, especially at a conference so the picture should assist those people who, like me, are not the best at committing names to memory! I love them! What do you guys think? Now it’s back to prepping–I really need to perfect my “hook sentence” and pitch! If anyone has any tips for attending a writers conference, I welcome your suggestions! Today was spent mainly becoming more and more panicked as I delved deeper and deeper into my research of the ten agents I have decided to query. It is hard not to get frustrated reading all these interviews and seeing agents speak about the biggest mistake authors make is querying too early. Perhaps I am falling prey to this, but to me, my manuscript feels ready–my query letter, maybe not so much, but it is getting there! I wonder if I am doing my homework too much on all these agents; reading so many of their interviews makes it seem like they go into a query with a pessimistic attitude. Maybe this is scaring me off unnecessarily. So now not only am I toeing the line between too hopeful and too pessimistic, but I am additionally straddling the balance of being over-prepared and under-prepared. As a first time novelist, there is a lot of risk no matter who I query–by default, I can’t list an impressive inventory of published works and accolades. Querying soon feels right, because currently I am very passionate about my novel–maybe it’s time to listen to my gut feelings a little more, and give the jumble in my head a bit of a rest. One thing is for sure, I need to give querying and researching agents a rest–particularly because I am heading to the Henderson Writers’ Group Conference in Las Vegas next weekend, and I need to focus on prepping for that! I am very excited about the opportunity to meet fellow writers, and get a chance to see the human side of some of these agents that are giving me so much anxiety right now. If anyone out there is heading to the conference next weekend, let me know, I would love to meet some kindred spirits! Today my baby blog is one week old, and even though everything is very fresh, I wanted to say thank you to my brand new followers who have liked, and even left comments on, my posts! As writers, we are different creatures than most–prone to tuck ourselves away in front of the computer writing or curled on the couch engrossed in yet another book. By default, writing is a lonely practice as it is a task one embarks on individually. This is why community, support and feedback is so important, and why I am so glad to get another avenue of that from my blog. When I first started seriously writing my novel, I reached out to two of my favorite former English professors from my alma mater who were published authors; it made me feel inspired and encouraged to start exchanging emails with them. I am excited to attend my first writing conference in two weeks in Las Vegas, where I am not only excited to personally connect with agents, but am also thrilled to have the opportunity to interact with more of my fellow writers! Once again, thanks to all the likes and follows so far on a constant chiaroscuro–stay posted for more on my conference prep and perhaps posting some writing samples from my novel!